Dame Judi Dench and author/actor Stephen Fry lend their voices to this multi-cast production of Mile's classic tale of Christopher Robin and all his friends in the Hundred Acre Wood. Alan Alexander Milne (January 18, 1882 – January 31, 1956), also known as A. A. Milne, was a British author, best known for his books about the teddy bear, Winnie-the-Pooh, and for various children's poems. 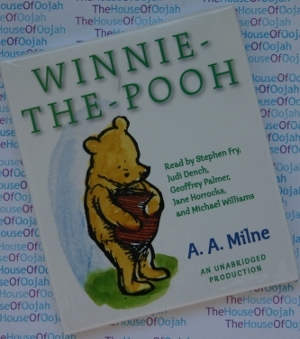 Milne was a noted writer, primarily as a playwright, before the huge success of Pooh overshadowed all his previous work. Milne was born in Scotland but raised in London at Henley House, a small private school run by his father, John V. Milne. One of his teachers was H. G. Wells. He attended Westminster School and Trinity College, Cambridge where he studied on a mathematics scholarship. While there, he edited and wrote for Granta, a student magazine. He collaborated with his brother Kenneth and their articles appeared over the initials AKM. Milne's work came to the attention of the leading British humour magazine Punch, where Milne was to become a contributor and later assistant editor of Punch. Milne joined the British Army in World War I and served as an officer in the Signal Corps. After the war, he wrote a denunciation of war titled Peace with Honour (1934), which he retracted somewhat with 1940's War with Honour). During World War II, Milne was one of the most prominent critics of English comic writer P.G. Wodehouse, who was captured at his country home in France by the Nazis and imprisoned for a year. Wodehouse made radio broadcasts about his internment, which were broadcast from Berlin. Although the lighthearted broadcasts made fun of the Germans, Milne accused Wodehouse of committing an act of near treason by cooperating with his country's enemy. Wodehouse got some revenge by creating fatuous parodies of the Christopher Robin poems in some of his later stories. During World War II he was Captain of the Homeguard in Hartfield & Forrest Row insisting on being plain 'Mr Milne' to the members of his platoon. Also during World War II, his home was destroyed in an air raid. Milne married Dorothy De Selincourt in 1913, and their only son, Christopher Robin, was born in 1920. In 1925, Milne bought a country home, Cotchford Farm, in Hartfield, East Sussex. He retired to the farm after a stroke and brain surgery in 1952 left him an invalid.